English weather is always unpredictable and as the saying goes, “Two days of sunshine followed by a thunderstorm”. Well, so far this Summer, that adage is proving to. be reasonably accurate. In the UK, August has traditionally been the main holiday period as it is the month when the best outdoor weather tends to come in more prolonged sunny periods. Whether people travel abroad or holiday remain in the UK on a Staycation as it has come to be known, August is the month which families look forward too a well earned break. Schools also have their extended holidays during this time and the start of the month frequently sees weekend traffic jams as the nation moves en-masse to their chosen holiday destinations. Now that I am retired, my wife and I are fortunately no longer restricted to the more popular holiday periods, but that does not stop us making good use of fine weather to take trips out on a visit or a picnic. 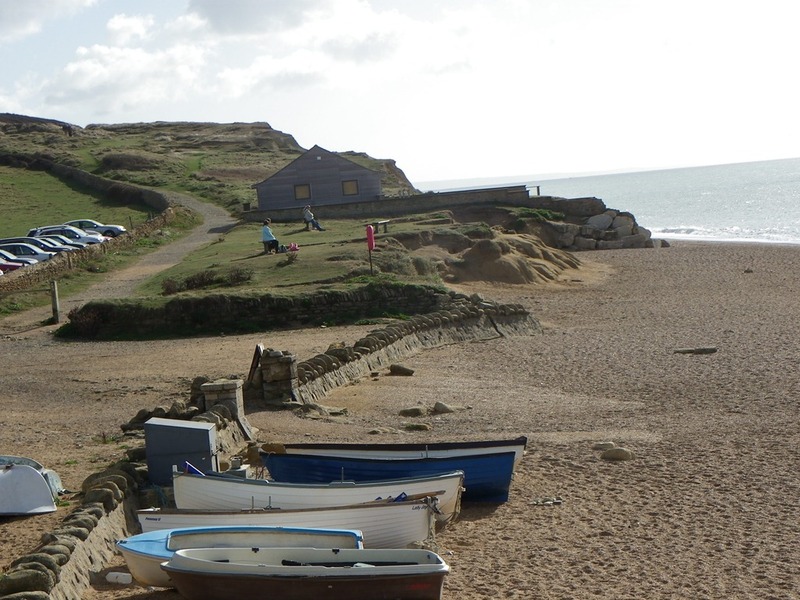 The South-West of England where we live has always been a popular destination for holiday makers, particularly with its many fine seaside resorts, beaches and spectacular scenery. It is still possible however to find less crowded and peaceful locations and out trip this week to Stonebarrow Hill on the Dorset Coast is one of them. 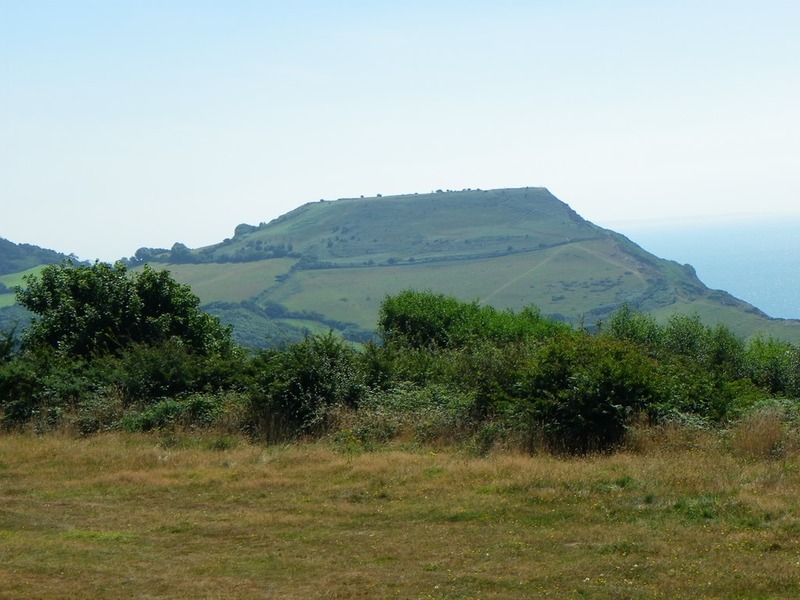 Stonebarrow Hill is a 148 metre high plateau sandwiched between the small coastal town of Charmouth and the well known Golden Cap which is the highest hill in the spectacular Lyme Bay. The land is owned by the National Trust and forms part of the World Heritage Jurassic Coast and the Coastal Path. Parking and access are free but if not travelling on foot, it does require motoring up a very steep and narrow lane that twists and turns and which is one vehicle width only. This means some give and take negotiation is necessary in the event of encountering on coming traffic. The plateau is traversed along a unmade road but with ample parking for cars, and the sides slope down steeply to the sea far below.. 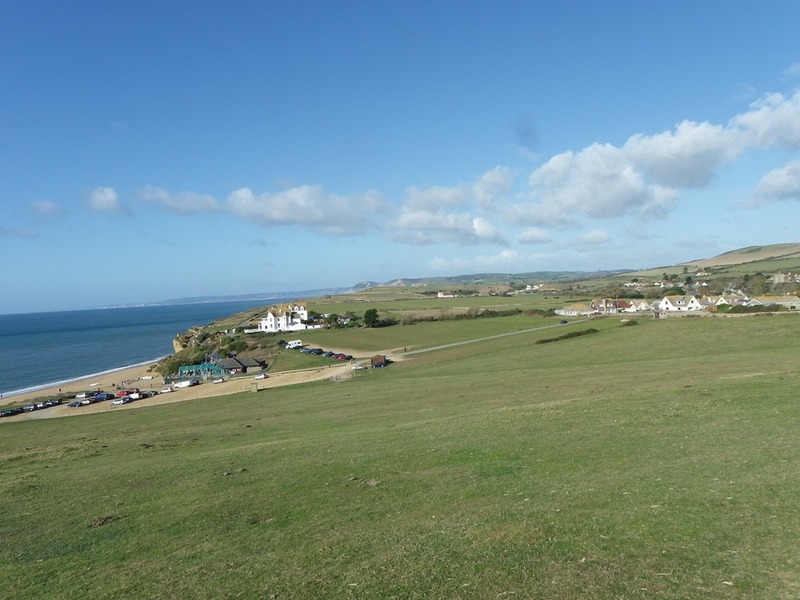 The views are breath-taking and it is possible to see the entire sweep of Lyme Bay on a clear day. The video below is a 360° panorama of just one part of Stonebarrow Hill. Spring has sprung and the grass has ‘riz’, I wonder where the fairies is?, as my dear old mother used to say. Well Spring is certainly now here, and the daffodils brought on a month early by a mild winter are still in bloom. I like daffodils and after a drab winter even if it was mild, they do add a welcoming touch of colourful freshness to the environment. The fields that abut our home are also full of new born lambs at the moment. It is amazing to watch how such creatures so frail at birth, have found their legs within minutes as they first suckle from their mothers. It only takes about two weeks for these new born lambs to “gang up” together with other lambs and go chasing around the fields in groups. The moment one of their mothers moves though, the group breaks up as they go scurrying back. Easter, now already come and gone was not particularly welcoming to those seeking a long break away after the long indoor months. Rain and wind just about sums Easter up and true to form, as soon as the holidaymakers had returned home, the winds abated and the sun came out spreading its first noticeable but much looked forward to warmth of the year. Fortunately I am now retired and as such,my wife and I are no longer tied to routines governed by early morning alarm clocks, commuter rush hours or daily routines. It is nice when the weather suddenly turns into a fine day to be able to say on the spur of the moment, “Let’s Go”. We tend to avoid going out much during Bank Holidays as we tend to find everything is a bit of a crush when millions of other people are intent on doing the same thing during their brief public holiday break. But then being retired, in it’s own way, every day is now something of a holiday break providing good use is made of it. One such day occurred last week and on the spur of the moment we decided to go on a picnic. Out chosen destination was Stonebarrow Hill on Dorset’s Jurassic Coast which is about a 50 minute drive from our home.. Stonebarrow as everyone refers to it locally is open countryside owned by the National Trust of which we are members. It consists of a 148 high metre hill with fields rolling down to the sea. 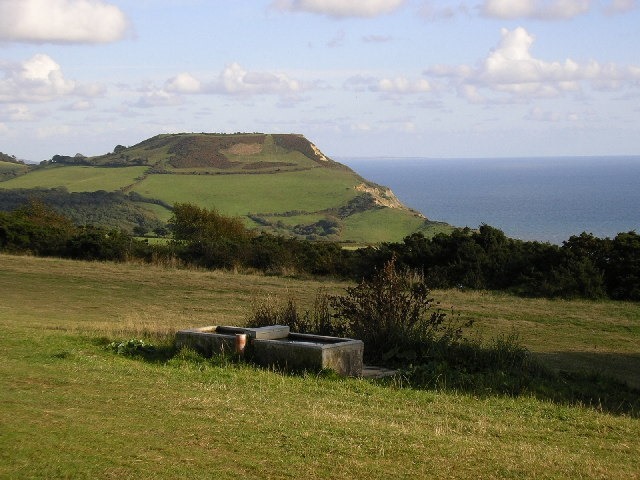 It is also adjacent to the renowned flat plateaued Golden Cap Hill which is the highest point of the large bight of coastline that forms the extensive and sweeping Lyme Bay. Stonebarrow is something of one of the National Trusts “hidden in plain view” gems. Stonebarrow Hill is accessed by the aptly named Stonebarrow Lane which starts just before entering the small coastal town of Charmouth. Motoring skills come very much to the fore when driving up Stonebarrow Lane. It is very steep, Normally first or second gear only.for a considerable distance. The lane is narrow with insufficient room for two vehicles to pass, so a bit of give and take using depressions in the hedgerow is essential when encountering oncoming traffic. The upper sections of the lane fall away to a deep ravine type hill as well. The effort is well worth it for the spectacular view from the top. Although National Trust property, there is no charge for access or parking.If you have a pair of binoculars or even a telescope, they are well worth bringing. The lower half of the land is part of the Coastal Path between Golden Cap and Charmouth and occasional hardy walkers can be seen traversing it. It is also a very dog friendly area and our Labrador “pup” Lou Lou now 18 months old and fully grown enjoyed racing up and down the slopes as she stretched her youthful limbs letting of steam in the process. The drive to Stonebarrow is quite pleasant too. Either via the A3066 from Crewkerne through the charming small town of Beaminster nestled in the northern Dorset hills, and with its narrow roads and market place, or back via the B3165 north of Lyme Regis towards Crewkerne once again.. In all it was a sudden and unexpected day out but one that holds the promise of many more such days in the forthcoming months. With the infamous Ides of March fast approaching, the past week has proved far from any ominous omens, quite the reverse. The last few days have regularly alternated between wet and welcome warm days as Winter starts to give way to Spring. The warm days are almost like the tendrils of a yet unborn Summer stretching backwards in time to act as an advance messenger of leisurely outdoor days that lie ahead. Our daffodils have now started to appear and grass that has been lying dormant for months has begun to stir. It is almost like a slumbering giant has awoken as the emergent Spring shakes off the remnants of Winter. We took the opportunity last week on the first really sunny day to go to Burton Bradstock in Dorset. This is part of the Jurassic Coast which provides a good vista of that huge bight of the South Coast known as Lyme Bay. From Burton Bradstock it is possible on a clear day to see all the way from Portland Bill to Exmouth and even Torquay. This view always conjures up in my mind that just a few miles beyond that distant coast likes both the mysteries and beauty of Dartmoor. 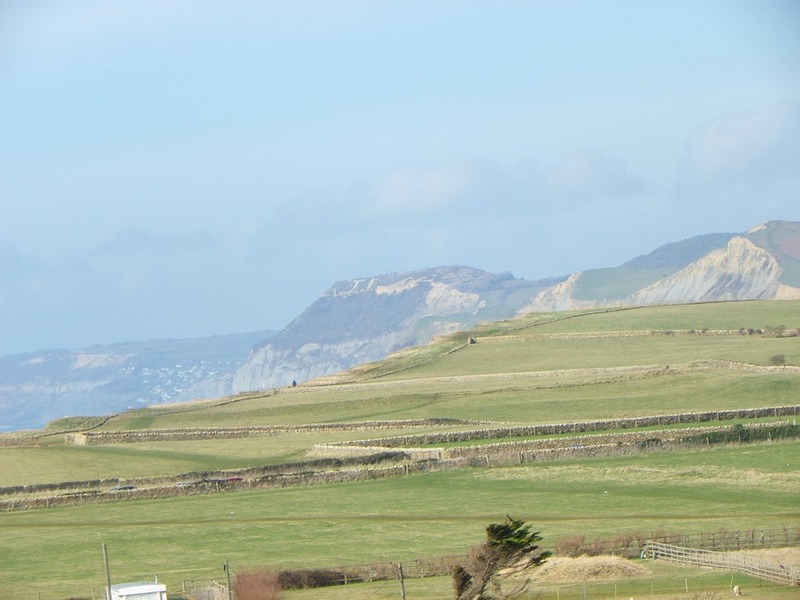 Nor far beyond nearby Bridport lies Golden Cap, the flat topped hill that dominates this part of the coast. Golden Cap like much of this coast belongs to the National Trust which should help preserve the beauty of this area for future generations. It was also the opportunity for our new puppy Lou Lou now some five months old to see the sea for the first time. One never quite knows how a dog will react to this new environment for the first time. 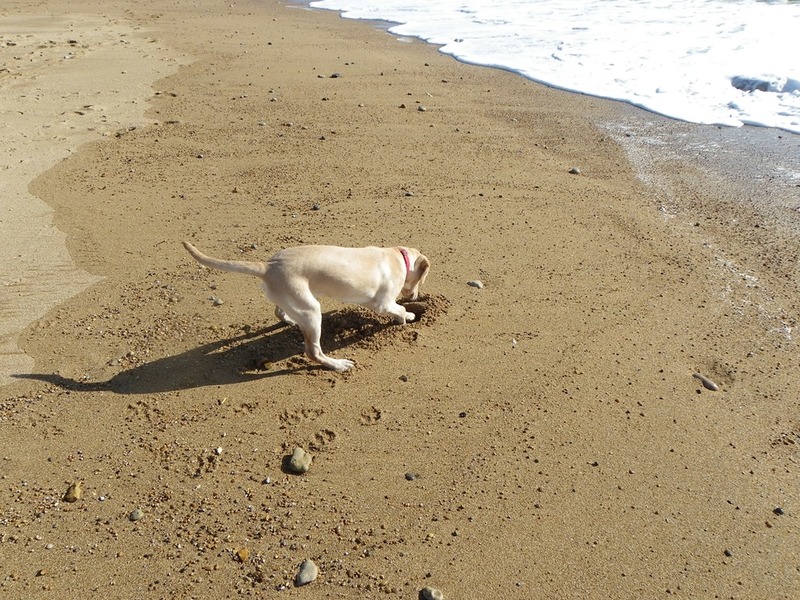 As it turned out, Lou Lou appeared quite indifferent apart from when an incoming wave suddenly took her by surprise as it swirled around her paws. Finding she could rapidly dig holes in the wet sand appeared to be more enjoyable to her. I also took the opportunity to drive to West Bay on the way home as I had not seen it for some time. West Bay might be better known as the location of the TV series “Harbour Lights” that was screened some years ago. It is a location I have always liked for its unspoilt non-commercialised appearance but I found a new monolithic block of residential apartments built directly alongside the harbour does little for myself in enhancing the ambience of this small seaside town. My wife and I are part of a group of friends in my village which has become known as the “Birthday Group” so called as each month we go out to lunch to celebrate an individuals birthday. Fortunate as we are in Somerset to have a large number of village pubs which serve excellent cuisine are modest prices, like most people we do tend to have our favourites. Our last outing however we went to a pub most of us had never visited before except for one member of our group whose birthday were were celebrating and for who our venue had more than special memories. 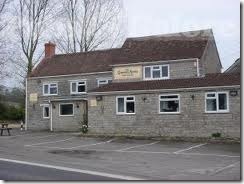 The pub was the Queens Arms at Wraxall in Somerset with extensive views over the local countryside. It is located on the only crossroads at Wraxall with the The Fosse Way, an important major Roman Road of it’s time, and part of the A37 road network. I think we were all very impressed at the extensive menu, well prepared and delicious meals, coupled with good service that we received at the Queens Arms, that it will certainly go on our favourites list. I would personally recommend a visit there to anyone who has the opportunity. Our companion took great delight in explaining he was born in a house located adjacent to the pub which has been subsequently demolished and replaced by a newer building. He was the son of a dairy farmer, a career he also pursued in later life and where as a boy, he helped his father make their own farmhouse cheese for public sale. Our friend recalled how each weekday he would walk along one country lane from the crossroads to go to school at the village of East Pennard. He also suspects that particular walk with modern traffic would be rather dangerous today as most country lanes are unpaved. East Pennard is close to the now internationally renown Worthy Farm where the Glastonbury Music Festival takes place. Our friend reminisced how as a lad during the war years, he would stand fascinated on the roadside watching convoys of military vehicles going about their business. During the run-up to D-Day, of which they were unaware at the time, he would see seemingly endless columns of military vehicles and troops making their way along the Fosse Way towards the south coast in preparation for the invasion. It was also during the war years due to manpower shortages his grandmother was also the landlord of the Queens Arms. It is strange how that same European conflict set a chain of events that led to him meeting his wife who is also a good friend of ours. She was born in pre-war Germany, the daughter of a Jewish doctor. Clearly her father was a very erudite man with a good sense of political nous who could foresee likely future events unfolding in that country. Wisely he was able to get his family out of the country to England before the tragic events that befell most of his fellow German Jewish countrymen. Although for given circumstances he could not immediately join his family, he was able to follow later before the full force of the Holocaust was unleashed. Our friend would certainly not describe herself as a writer but she is more than conscious that her personal memories do form an important period in history. Consequently she has been busy consigning all her memories to paper so that someone in the future can make good use of them. Her memories should prove interesting reading. April arrived not to the normal slow but gentle warming of a departing March but on the tail end of a mini-heat wave. Unseasonal as this advanced and unexpected outburst of Summer may have been, it was never-the-less welcome following a dreary winter. In some ways, I feel pulled between two directions at once. On one hand is the longing for the future Summer sun, tempered by the need for good rainfall on the other hand as warnings of future drought conditions become increasingly stronger. I placate myself with the thought there is nothing I can do about the weather anyway, I might as well enjoy or endure whatever the weather may bring. Que Sera Sera as the Italian’s would say, whatever will be, will be. We did however take a trip to Burton Bradstock on the Jurassic Coast in Dorset. From our home it is only a 45 minute trip and the coastline and countryside are so beautiful in this part of the country. 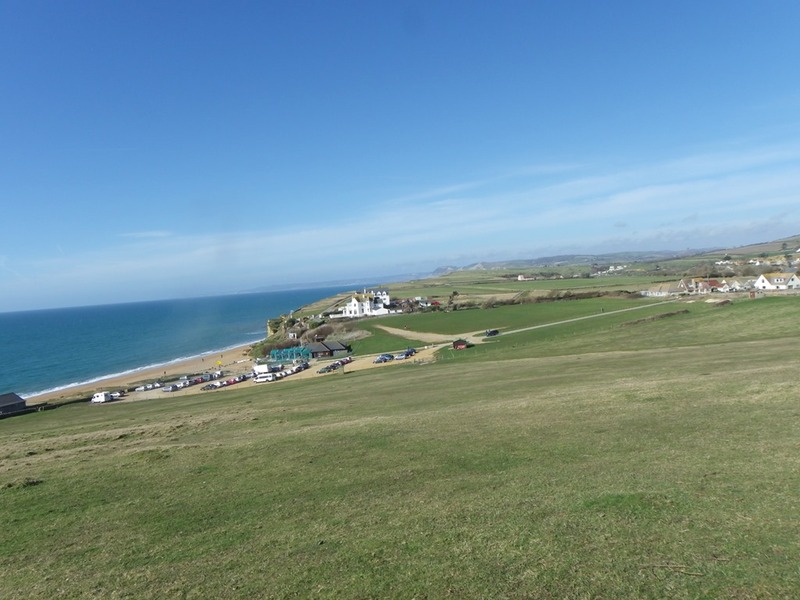 Burton Bradstock is an un-commercialised village nestling between surrounding hills. The short road from the village to the beach terminates in National Trust property and from there the coastal path stretches in both directions to Portland Bill to the east and through Golden Cap to Lyme Regis and Exmouth in the west. This large distinctive semi-circular stretch of the English coast is known as Lyme Bay. The shoreline and cliffs of the Jurassic Coast continue to yield a seemingly endless supply of new fossil discoveries. I cannot help but wonder how much the Earth has changed since these long extinct creatures left their imprint in the sands so many million of years ago, that the sand has since become a rock face. The Easter holidays are now only a few days away and like migrating flocks of birds, it will be the signal for the annual tourist season to begin as once more droves of traffic makes the trek westwards for people seek the respite of the much loved West Country. I think it has been estimated that during the peak season, the population of the West Country more than doubles due to visitors.